I was yesterday at the Dominican Republic and Haitian border crossing at Dajabon on the Northern part of the line dividing these two countries. What I saw was an apocalyptic picture. As far as the eye can see, there was a sea of humans, see attachments. I came to the border with the intention to cross into Haiti on bicycle, than take local bus to town Cap-Haitien on the Atlantic Coast. But I quickly realized that I will not be able to ride bicycle. I will need to push the bicycle through a thick crowd of desperate people. So I canceled my plan. It is possible to cross border on bus operated by Caribbean Tours bus company. 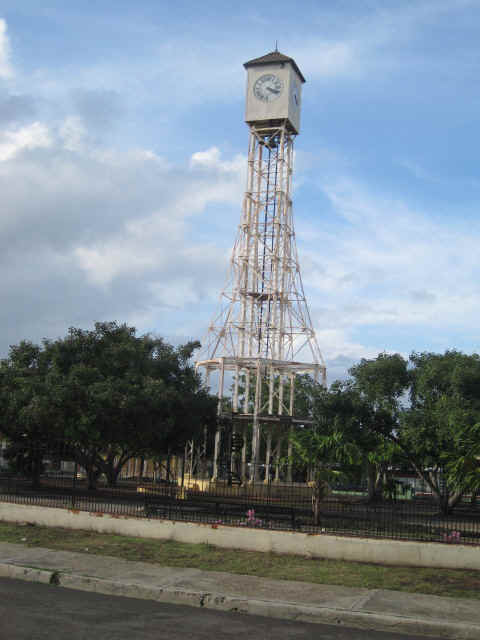 When I was there, a big Caribbean Tour bus just came from Cap-Haitien carrying a few passengers and only one white person, an old and very exhausted looking French man. 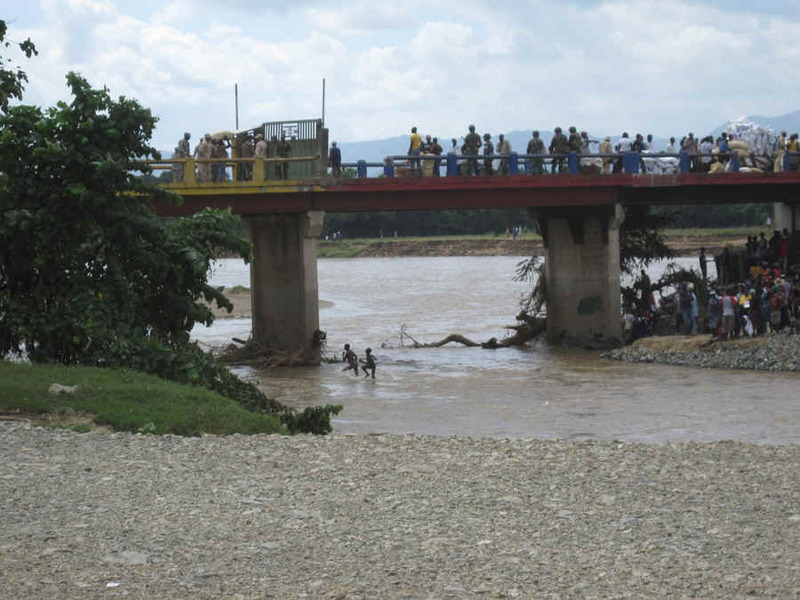 This Norther part of Haiti was not affected by earthquake, cholera and recent hurricane but the border crossing is closed for Haitians. Still, all these people came with the only desire to escape from their country. 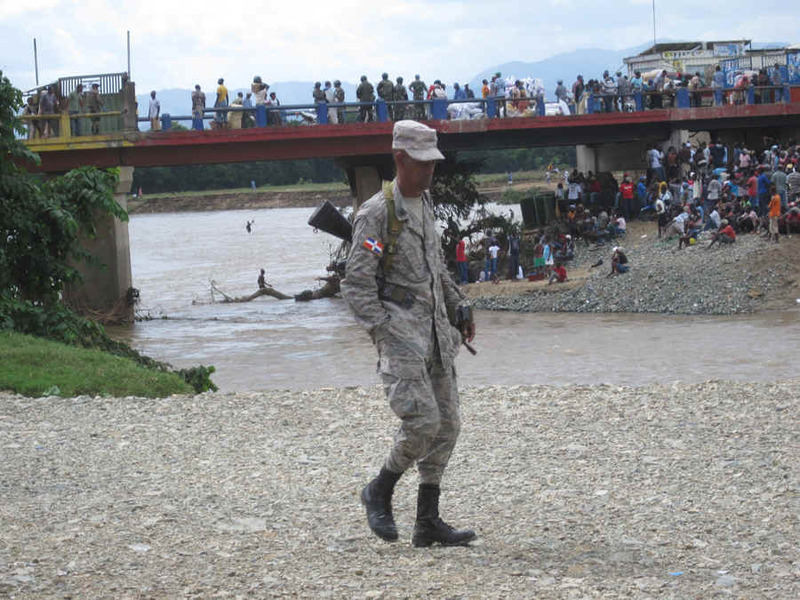 Dominicans definitely do not want to admit a flood of Haitian refugees. Dominicans/Haitians relationship is described by Lonely Planet book in such words: "Haitians are physically much darker then most native Dominicans and are widely viewed as violent or uncouth" Dominican Republic tour-book 3rd edition page 34. My Dear Readers, I write my TN only when I have something interesting to report. I did not expect anything interesting to report from Dominican Republic, which is a mostly package tourism destination country. So I even did not announce my trip to you. Now I changed my mind. I flew to Dominican Republic two weeks ago on a cheap ticket from Spirit airlines. I expected to do some snorkeling and took my spear gun and snorkeling stuff. As an experienced traveler I know that places which are highly recommended in tours books and by travel agencies are probably already spoiled. It is like with stocks, those which are heavily promoted are probably too late to buy. Catalina and Saona Islands are the main tourist destinations. This is what LP writes about Saona: "Much of its beautiful beach has been filled with snack shacks and private seaside buffets, operated by all inclusive for use by their guests. Music blasts from competing sound systems....". 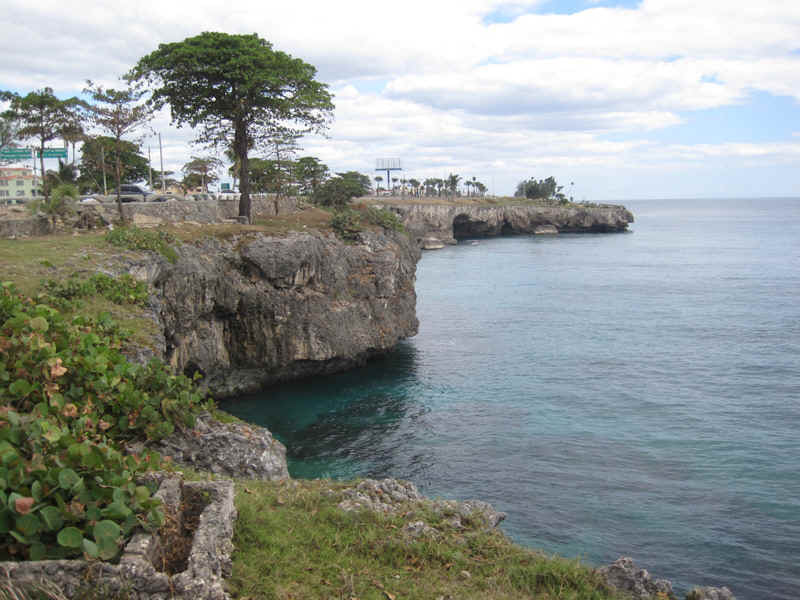 La Coleta National Underwater Park between Santo Domingo(SD)and its airport is recommended for its coral life. 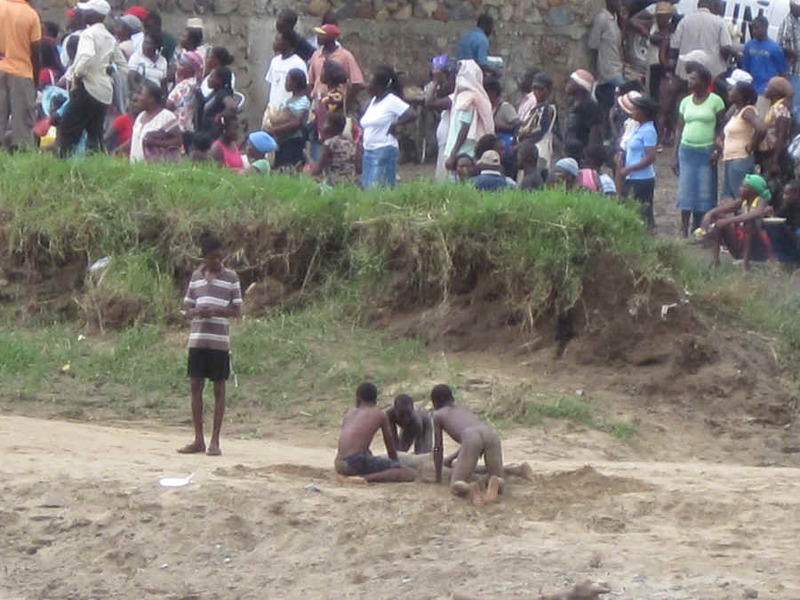 On my way from airport I saw a crowd of people on the small sand beach in this park. Later in dive shop I was told that corals where are completely destroyed. 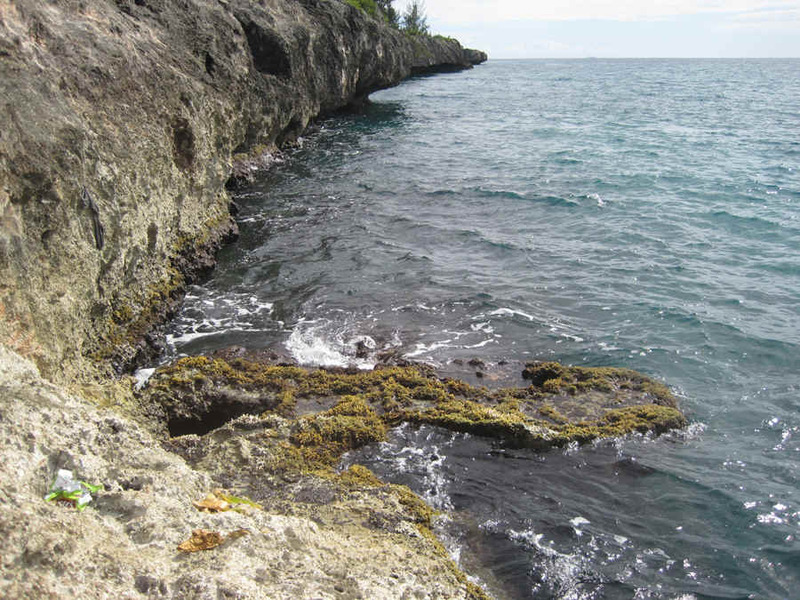 Entire shore (25 km) between SD and airport is formed by limestone, eroded by the sea. So, there are mostly vertical, or even negative angled walls about 5 meters tall. The only safe access to the sea is through that small beach, which I just mentioned. However I found a place where with some skill it is possible to descend to the sea and get back. And I was rewarded with great undisturbed underwater scenery with senotes! and with fair amount of corals and fish. I even killed a couple fish and boiled them later in my hotel. I learned how to make excellent fish soup using my large mug and electrical spiral. It is no problem to get to the sea. But when you got back you have to climb slippery and sharp rocks, which is especially difficult to do in fins and with fish and a gun in your hands. This is how i got scratched. See attached picture. Later I found best way, how to get out of water. You have to remove fins and climb on rocks in socks. I borrowed this idea from my daughter who used socks to escape from her roof window when she was a teenager. By the way, if you will be where, that place to decent to the sea is right near the sigh "Cargo Airport"
My trip is finished. I am at home. I have a couple last notes on my trip. 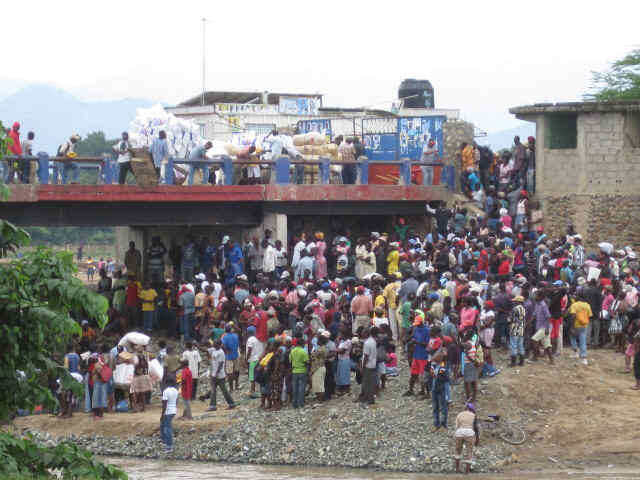 Reader KK asked me to put some more pictures from the Haitian border crossing. They are in attachment. After I left that place it was riot there and in Cap Haitien. 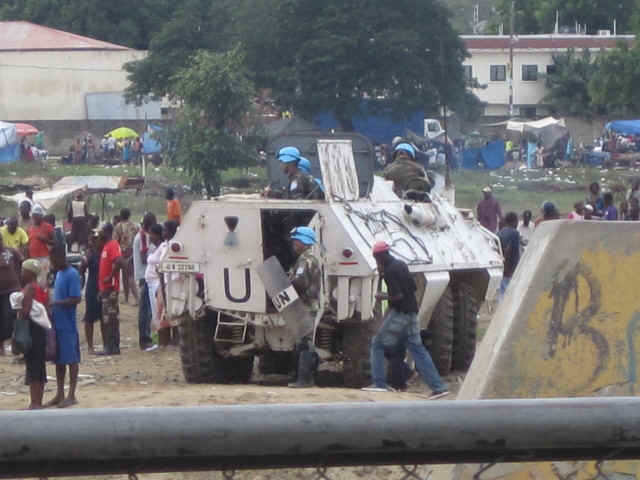 Several people were killed including at least one peacekeeper. The river separating the two countries is small. On one picture two boys are crossing the river. They will be returned by border guards. However, the Dominican Republic is a small and poor country, and they cannot afford to build a 2000 mi fence like USA. 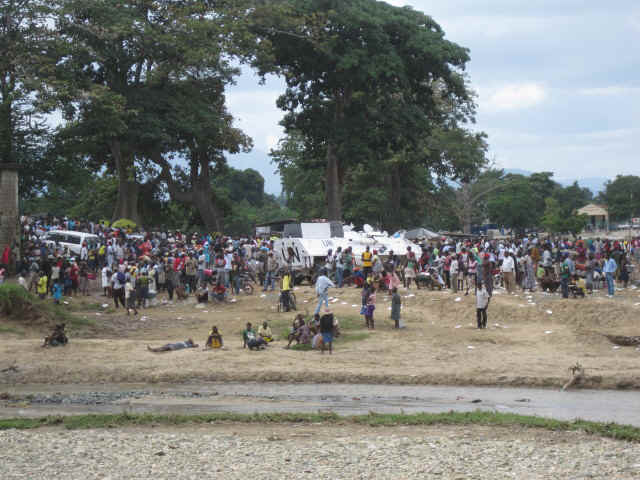 Haitians are still crossing into DR in large numbers. One case of cholera was already registered in the country, which triggered a chain of warnings from health officials. Chief of Russian Health Ministry for example told Russian tourists do not go to DR. This can be deadly for this county, heavily depending on tourism. Actually probability for tourist to get cholera in DR is zero. The country is quite civilized. In every toilet there is toilet paper and soap. In Santo Domingo I stayed in quite a nice hostel, Bettye's Exclusive Guest House ($22), popular with Haiti volunteers. They described a quite gloomy picture from Haiti. In 50 degree heat volunteers from around the globe shovel demolished buildings and clean up clogged sewerage systems. Local people watch from the sidewalks! It looks like a complete failure of the liberal, humanitarian approach to the disaster management. There are 1,500,000 idle people affected by earthquake. All of them dependent on food provided by Western Aid Agencies. Tough situations require tough measures. Why not put them to work? "Who does not work, he will not eat". Port au Prince would be restored by now and the morale of local people would be much higher as they learn that they themselves fixed their city, not white foreign people. Dominican Republic is the country of dream full-filled... for some. I had a dinner in a restaurant. I was alone at my table. A couple came and found no seats. I offered them to sit at my table. They were a handsome black man about 30 and very very old German lady, maybe 80. The lady was talkative. In order to stop right away any suspicious thoughts, she told me that they are married and showed me the ring. She and her husband spent half of the time in Germany, half time in DR. You frequently can see usually not very good looking white women walking in the streets with a handsome young black man or two. The women found their happiness here and probably didn't need to spend a fortune on it. Country of full-filled dreams! 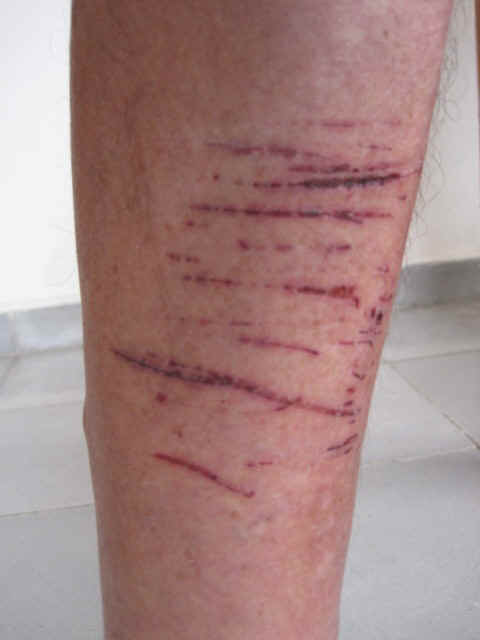 As I already wrote to you, access to the sea is difficult in the Santo Domingo area. In attachment you can see easy access to the sea near Santo Doming International airport which I found. 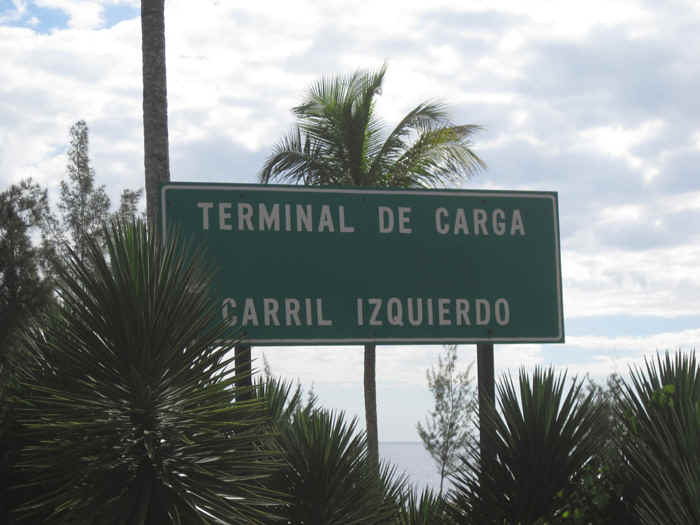 It is located between two signs for Cargo Airport. You can jump to the sea minites after exiting the plane. Sea life here is much better then sea life which I saw during my scuba trip from Boca Chica.